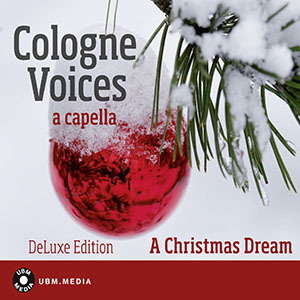 Beautiful a cappella renditions of true and trusted Christmas classics. Surprisingly charming, yet touching. Sung by vocal ensemble Cologne Voices. English version of traditional Christmas hymn Adeste Fideles. Popular US American Christmas song that was first released in 1957. Traditional Christmas, yuletide, and New Years' carol. Its origins range back to the 16th century. German version of the famous Christmas carol from 1837. Meaning "In sweet rejoicing", In Dulci Jubilo is a traditional Christmas carol, sung in German and Latin. Modern Christmas tune with a hint of gospel. Joyful and uplifting. "O Christmas Tree" is a German folk song, sung as a Christmas carol. Very famous song, unconventionally arranged. A former top ten hit that became a Christmas classic! "Lo, How a Rose E'er Blooming" - A festive hymn of German origin. One of the most popular Christmas carols in Britain. First published in the 19th century. Folk song; Austrian christmas tune. Popular Christmas song from the 1930s. Extremely popular Christmas song that was No.1 of the Billboard charts in 1949. German Christmas carol ("Oh come, little children). Irving Berlin's famous Christmas song. An American classic, written in 1945. Traditional German Advent song, became popular in the beginning of the 20th century. Originally from Austria, this is one of the most popular Christmas songs worldwide. Written in 1943 for the musical movie "Meet me in St. Louis", this is one of the most popular Christmas carols in the US.